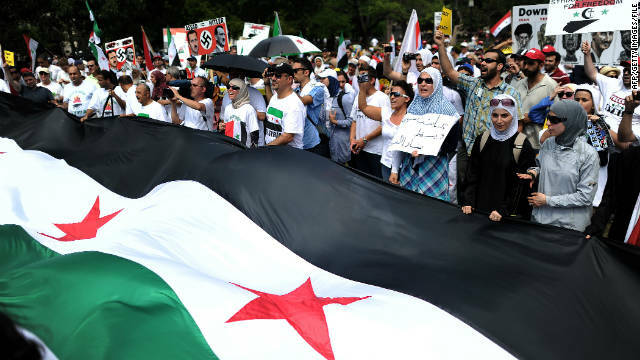 Protesters shout slogans during a demonstration against the Syrian government in front of the White House in Washington in July. A Syrian-born naturalized American was ordered held in custody Wednesday after he was charged for allegedly spying on Syrian protesters in the United States. Judge Theresa Buchanan at the U.S. District Court for the Eastern District of Virginia ordered Mohamad Anas Heitham Soueid, 47, held until Friday, when there will be a detention hearing. Prosecutor Dennis Fitzpatrick told the judge that Soueid was a flight risk. Soueid, of Leesburg, Virginia, was charged October 5 in a conspiracy to collect video and audio recordings and other information about people "in the United States and Syria who were protesting the government of Syria and to provide these materials to Syrian intelligence agencies in order to silence, intimidate and potentially harm the protestors," the Justice Department said Wednesday. A federal grand jury charged Soueid in a six-count indictment and he was arrested Tuesday. He is charged with conspiring to act and acting as an agent of the Syrian government in the United States without notifying the attorney general as required by law; two counts of providing false statements on a firearms purchase form; and two counts of providing false statements to federal law enforcement, the Justice Department said. This comes amid Syria's seven-month-long crackdown against protesters. "Today's indictment alleges that the defendant acted as an unregistered agent of the Syrian government as part of an effort to collect information on people in this country protesting the Syrian government crackdown. I applaud the many agents, analysts and prosecutors who helped bring about today's case," said Lisa Monaco, assistant attorney general for national security. The indictment says Soueid has been an agent of the Syrian Mukhabarat, a reference to Syrian intelligence agencies. "At no time while acting as an agent of the government of Syria in this country did Soueid provide prior notification to the Attorney General as required by law, the indictment alleges," the Justice Department said. "Under the direction and control of Syrian officials, Soueid is accused of recruiting individuals living in the United States to collect information on and make audio and video recordings of protests against the Syrian regime - including recordings of conversations with individual protesters - in the United States and Syria. He is also charged with providing the recordings and other information to individuals working for the Mukhabarat. According to the indictment, Soueid and others conspired to use this information to undermine, silence, intimidate and potentially harm those in the United States and Syria who engaged in the protests." In late June, the Syrian government paid for Soueid to travel to Syria. He met with intelligence officials and privately spoke with President Bashar al-Assad, the indictment said. "In addition to the recordings, Soueid is accused of providing the Mukhabarat contact information, including phone numbers and e-mail addresses, for protesters in the United States. In a handwritten letter sent to UCC-1 (an unindicted co-conspirator), Soueid allegedly expressed his belief that violence against protesters - including raiding their homes - was justified and that any method should be used to deal with the protesters. The indictment also alleges that Soueid provided information regarding U.S. protesters against the Syrian regime to an individual who worked at the Syrian Embassy in Washington, D.C."
The indictment said FBI agents interviewed Soueid and he is accused of lying "when he denied that he had collected information on U.S. persons and transmitted that information to the government of Syria." "In addition, Soueid allegedly made further false statements when he denied to FBI agents that he had directed someone to audio or videotape a conversation, meeting, rally or protest, or that he was aware of any individual taking photographs or videotaping people. He also allegedly made false statements when he denied that he had ever been an agent of the Syrian government or a foreign intelligence officer." "The ability to assemble and protest is a cherished right in the United States, and it's troubling that a U.S. citizen from Leesburg is accused of working with the Syrian government to identify and intimidate those who exercise that right," said Neil MacBride, U.S. attorney for the Eastern District of Virginia. "Spying for another country is a serious threat to our national security, especially when it threatens the ability of U.S. citizens to engage in political speech within our own borders." If Soueid is convicted, he faces a maximum penalty of 40 years in prison. Soueid is also known as Anas Alswaid, the Justice Department said. Alswaid had been named in a civil suit in the U.S. District Court for the District of Columbia by Syrian citizens or Syrian-Americans who say they have been subjected to abuse or are family members of those who have been abused by the defendants. Along with Alswaid, the defendants include the Syrian Arab Republic, the Ministry of State Security Intelligence, al-Assad's brother Maher, the Syrian ambassador to the U.S., Imad Moustapha, and others. The suit was filed in May. "Alswaid is an integral part of the criminal conspiracy to torture, maim, and kill Syrians. Through his efforts, the al-Assad regime learns the identities of Syrians based in the United States, who are trying to assist in the efforts to counteract the tactics of the al-Assad regime. He transmits such information to Damascus to initiate criminal conduct against the families of the identified Syrians," the suit alleges. Well, The Guardian is reporting that Iran is asisntisg Syria in its crackdown on rebels. What a wonderful, and revealing irony, that Israel is joining Iran in desiring to keep a dictatorship in place, and that their interests are best served by hardline governments who repress their people. After all, despite the reams of dissembling and camouflage, it turns out Israel hasn't any time for genuine democracy, either at home or surrounding it. The only democracy acceptable to it is a manipulated, selective and gerrymandered one at home, and none at all elsewhere. Funnily enough, Iran, like Israel, has elections but there is no genuine choice or enfranchisement of the population, whilst the ruling ideology is kept intact and out of bounds. Anti-democrats appear to have more in common than they have differences.